After a little wait in the rain, my friend and I, who had come directly from work, were let into an already bubbling atmosphere of people, smalltalk and smiles everywhere. Everybody seemed genuinly excited to be there and to experience Soleil Froid, Palais de Tokyo’s newest exhibition. Although I was thrown off for a minute by the excessive amount of beautiful, welldressed people, and the mounting wish for an afterwork beer, we quickly went downstairs and started moving our way through the underground labyrinth that is the lower floor of Palais de Tokyo. The place was crowded, but not in a bad way, and we enjoyed the very diverse pieces. We even found a piece by a danish artist, of a talking depressed fox in a mirror telling the story of the worlds demise, and I took a mental note and a phonephoto, to show to the good people at the embassy. The idea was, that maybe, in the realm of danish culture, I could get to come back during worktime and study it a bit closer. It never happened, but in the moment I felt at the epitomy of my cultural journey. A little while later, we worked our way out of the downstairs labyrinth and into the arms of a cold beer on the first floor. We stood for a while and observed the people, until we noticed a corner covered with mirrors that seemed to be the entrance to something. Having recalled, that earlier, there used to be more exhibitions back in that corner, we made our way, past beautiful girls and boys in colorful clothes, until we were in front of the glimmering entrance. And that is when all seriousness, if there was any to begin with, evaporated. We found ourself in a hall of mirrors, as the ones you know from your childhood, and instantly we became five years old. We walked around, amazed like babies, looking at our own images reflected all over. On the other side of the mirrored hall, the game of lights and mirrors continued as we, mesmerized by tiny pieces of mirrors, several light installations and a lit labyrinth of cloth, walked through what felt like several rooms of light and shadow. The excitement would have no end and everyone, old ladies as well as perky young hipsters, seemed enthralled in the same feeling of light and lightness. Of uncomplicated beauty and whimsicalness. We felt happy and serene as we crossed the corridor and entered, what we assumed to be, the front hall that we came from. But we had misjudged the size of the museum and instead we found ourselves in the exact opposite of where we came from. We entered a big room and were immediately overwhelmed by the noise of what seemed to be a hundred schoolchildren. But instead of schoolchildren, what we saw were our fellow museumguests. Running around, stomping and throwing with things. In what can only be described as a big circus. We shrugged and joined the games. I took pictures as my friend happily stomped around on a noisemaker disguised as an installation, and we tried out several viewdistorting sunglasses. After a little while we quickly tired of the noise, and with tired eyes and excitement in our bodies, we returned to the dark, quiet coolness of the parisian evening. The last part of our journey had washed out any desire I had to be pseudointellectual, or even to retain the name of a single artist. I went home with a smile on my face and a photo of a talking fox on my phone. I will come back another time to see the rest of the pieces once more, but for this evening, I had a wonderfull time just being five years old again. Le 16 Mars 2013, un lieu unique dans le quartier magique du Marais à Paris, a ouvert ses portes à KSAT à l’occasion d’une soirée dédiée à la confusion sentimentale et à la poésie. Marcovaldo, 61 rue Charlot, s’est transformé ce soir là en une sorte de théâtre et tout le monde s’est fait petit pour rentrer dans cet espace douillet! 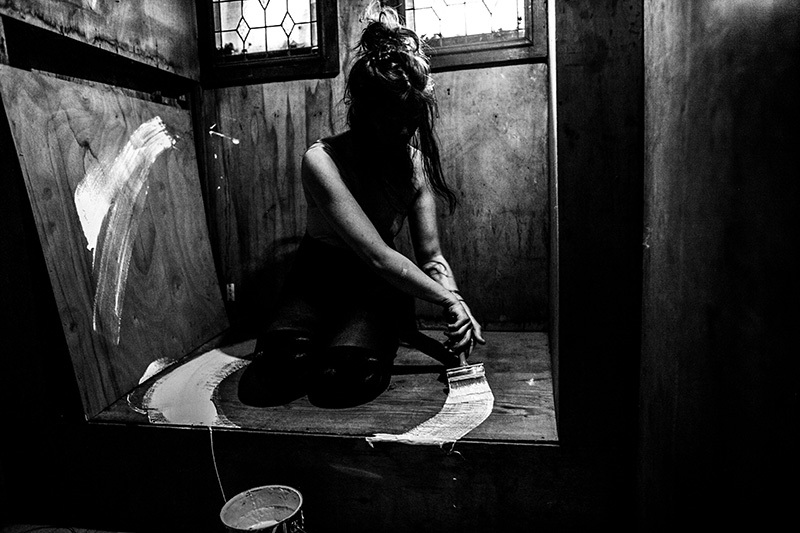 Ça va sans dire que l’atmosphère était chaude et passionnée, la soirée a débuté avec une performance de la danseuse Alice Martins, en collaboration avec le musicien Neue Graphik et le poète italien Marco Colabraro. Ensuite Yasmine et Martina ont raconté au public l’incroyable histoire de KSAT et présenté le projet KSAT CAMP pour la première fois, à travers des dessins de Yasmine. On a eu l’honneur d’avoir parmi nous Ksénia Lukyanova, comédienne et scénariste sibérienne, pour présenter son court métrage 14 Septembre en avant première, réalisé en collaboration avec Christian McCallum (Sudafricain) et une équipe internationale. Enfin la poète Jordan Karnes nous as rejoint par Skype de Oakland pour nous lire une série de poèmes et présenter sa vidéo-poésie « Can’t be in the body without ». LOVE IS ALL! On March 16th a unique spot, in the magic Marais in Paris, opened its doors to KSAT in occasion of a night devoted to sentimental confusion and poetry. 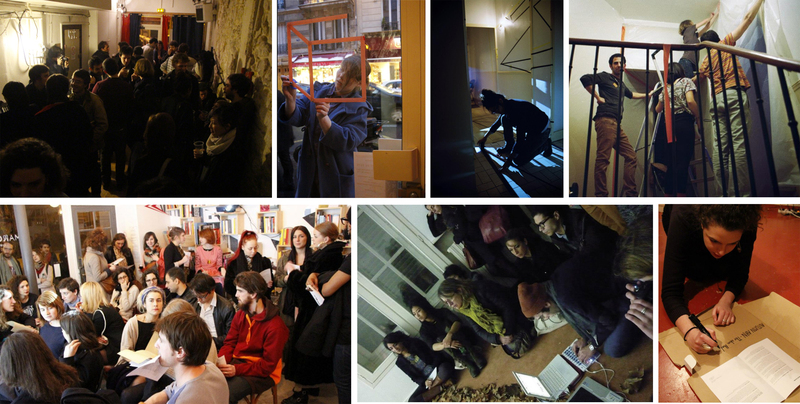 Marcovaldo, 61 rue Charlot, was transformed for a night in a kind of theater and everybody made himself tiny to have access to this narrow little space! 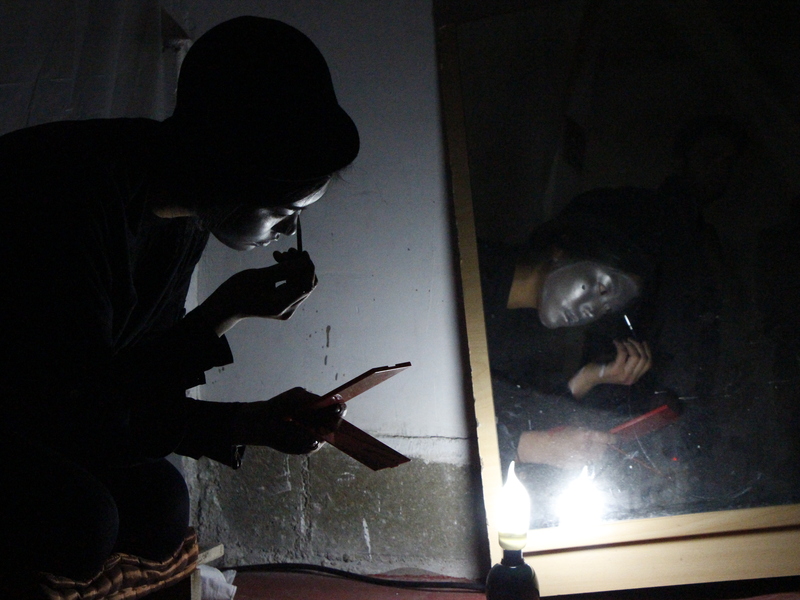 The atmosphere was hot and passionate as you can easely imagine, the night began with the performance of the dancer Alice Martins, in collaboration with musician Neue Graphik and the italian poet Marco Colabraro. 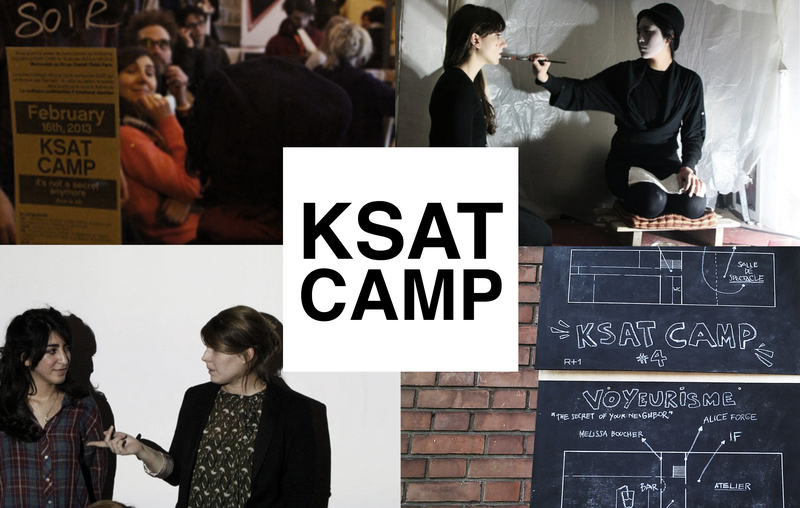 Further on, Yasmine and Martina told to the public the funny story of KSAT and presented KSAT CAMP project for the first time, through Yasmine’s drawings. We had also the honor to see the participation of Ksénia Lukyanova, siberian comedian and scenarist, there to annonce her short movie 14 Septembre in preview, realized in collaboration with Christian McCallum (from South Africa) and an international team. Following, poet Jordan Karnes in connection with Paris from Oakland through Skype, read us a series of poems and presented her video-poetry « Can’t be in the body without ». LOVE IS ALL!